Venezuela gets serious about oil production? This entry was posted in Uncategorized on April 26, 2011 by Steven Bodzin. Colombia faces its worst natural disaster on record due to the effects of relentless heavy rain that … has killed at least 69 people in April alone, bringing the total death toll to at least 90 … damage in 28 of the country’s 32 departments, and has blocked 16 major roads due to landslides. Some have collapsed entirely… This month at least 36 people have been wounded and eight are missing, while another 98,000 were injured and 183 homes were destroyed … the total this year to 15 missing and 208,581 people affected by the disaster, according to the Interior and Justice Ministry. In 2010 more than 300 people were killed by the effects of heavy rain. But I think it’s worth pointing out that will delay oil exploration and development. I’m busy with a rash of paid work, but if you are an investor in a Colombia-exposed company, you might call and ask how things are going. Feel free to let me know if you hear anything. The skipper involved in an oil protest off the East Cape yesterday has been charged… operating a vessel in an unsafe manner…. The man, believed to be skipper Elvis Teddy, was arrested yesterday amid a protest by iwi Te Whanau a Apanui-owned vessel San Pietro against Brazilian oil giant Petrobras’ survey ship, Ocean Explorer… The Ocean Explorer is doing the first seismic study of the Raukumara Basin area off the East Coast since the government awarded Petrobras a $151 million five-year permit last June. Did I mention that the website thinks the arrested individual is named Elvis Teddy? I think this wins Best Name of the Year So Far award around here. Interesting situation. This entry was posted in Uncategorized on April 25, 2011 by Steven Bodzin. Another guest post from the increasingly reliable Quasecarioca, who is ably observing and analyzing the vast eastern half of South America for those of us too lazy to practice our Portuguese. Madeira river. Image stolen from International Rivers, click it to go to their site. Industries and markets pay most attention to social issues when they start costing money. The plight of workers in the remote Amazon is a clear example. Analysts are now predicting a 20 percent rise in generation costs for upcoming hydroelectric projects as a result of riots in March that halted two of the biggest dams in construction in Brazil. In a confused melee involving complaints about working conditions (the exact circumstances are still not clear), workers set fire to buses and burned down barracks at the Jirau hydroelectric project in the Amazon state of Rondonia near Bolivia, requiring the sister project Santo Antonio to halt construction as well. The incident creates a political headache for President Dilma Rousseff, who is heavily promoting the projects because they are among the largest in her $1 trillion infrastructure development plan. It is also creating a financial headache for industries trying to lock in future power supplies. Not only are workers going to demand higher wages, but contractors that build hydropower projects are going to be looking at higher insurance costs given the increased risk of facilities being burned to the ground. This outbreak of violence should not have come as a much of a surprise because Jirau is the same as most Amazon boomtowns. Politicians put heavy pressure on the Energia Sustentavel consortium, which includes French utility behemoth GDF Suez, to have the dam operational by 2012. They hired workers at a furious clip, bringing some 24,000 mostly from the poor northeast of the country to worker camps along the Madeira river where the dams are being built. Towns swelled, brothels proliferated, local teenage girls got knocked up by migrant workers, crime increased, boat traffic scared the fish and left the fisherman looking for other things to do. Now the startup date has now been pushed back until 2013, and the companies are firing some 4,000 workers who are now unneeded. The government’s strategy of ensuring low-cost hydroelectric power is an unfortunate holdover from the dictatorship era when making cheap energy was much easier. Now faced with environmental licensing, indigenous rights legislation, and higher labor standards, keeping a lid on costs is not what it used to be. (Brazilian consumer power rates, by the way, happen to be among the world’s highest because almost half what folks pay goes to taxes or fees, making it good business for the government). This does not bode well for the giant Belo Monte dam, which is already the subject of celebrity criticism and international condemnation. Another flagship infrastructure project, this one to be sited along an Amazon tributary called the Xingu, it has become a lightning rod for criticism before the work has even started. The consortium has not even gotten started on around half the social projects that are supposed to mitigate the impact of the project. Construction is now almost six months behind schedule, but the consortium insists it will open as promised in 2015. I can’t say I see a lot of easy alternatives to this strategy. Brazil’s economy is growing and is going to need more power. But these issues aren’t going away. Also, the Chile mine rescue returns. This entry was posted in Uncategorized on April 23, 2011 by Steven Bodzin. 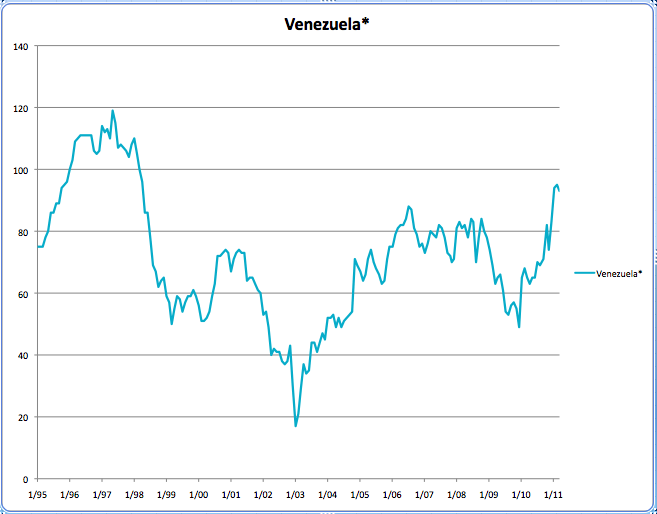 Why did Chavez boost oil “special contribution”? The contribution will now take 80% of each dollar above $70 a barrel, 90% of each dollar above $90 and 95% of each dollar above $100 a barrel. In other words, if a company sells at $120 a barrel, it now has to pay $44 of that to Fonden — making it the same as selling oil at $76 a barrel, without the special contribution. The $76 a barrel is then taxed at the usual rate for extraction tax, royalties, income tax, and so forth, taking a minimum 50% off of gross sales. With its indifferent, deadpan tone, this article reads like something out of the Onion. But it’s a serious news article. Informe25 reprints an article from the Isla Margarita Sun, saying oil is washing up on Isla Margarita, a tourist island in the Caribbean off eastern Venezuela. 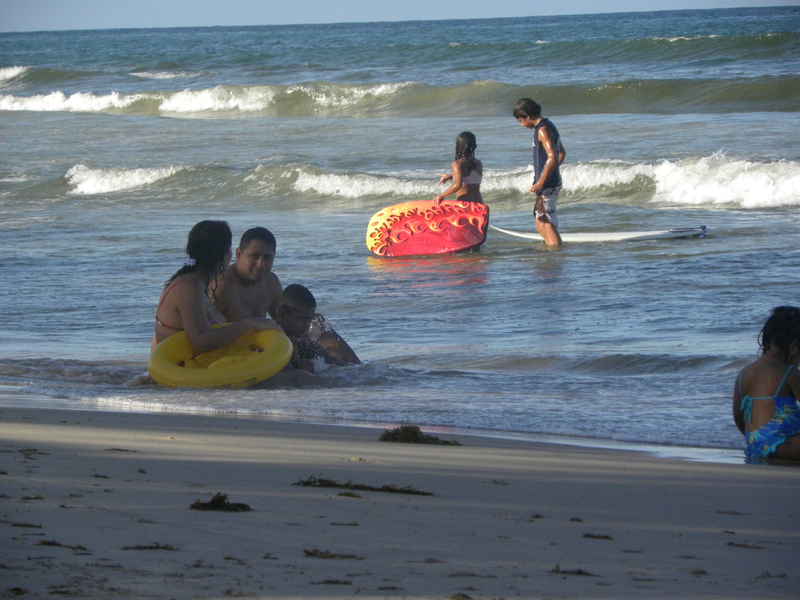 It’s Semana Santa, the biggest tourist time of the year, so the government has to decide — do we protect public health or do we let people swim in crude oil and let business make some money? And the visiting public has to decide — complain and go to another beach, or have another beer and put up with a little black spot on the beach towel? If you can understand both the public and government response, you will be on your way to understanding the nature of both “socialism” and “public opinion” in Venezuela.